Acer today debuted the new 8-inch Iconia W4 tablet that features IPS and Zero Air Gap technologies providing a sharp display with enhanced clarity and brightness. In addition, the Iconia W4 is also equipped with Windows 8.1 and a 4th Generation Intel® Atom™ processor, offering faster tablet performance as well as battery life up to 10 hours for web browsing and up to 8 hours for video playback(1). Compact enough to hold in one hand yet spacious enough for comfortable viewing, the Iconia W4 brings mobile productivity and media consumption to the next level. It targets active and professional users who want a tablet that's easy to carry and convenient for the multitasking they do -- all in one sleek device. It comes preloaded with Microsoft Office Home and Student 2013, at no additional expense, for managing documents, and an optional ultra-slim and portable keyboard for those who need to type as well. Equipped with an IPS technology display, the Iconia W4 provides consistent images, color and brightness from a wide range of viewing angles, up to 170 degrees, so it is ideal for sharing with others. Furthermore, Zero Air Gap technology removes the air in between the touch panel and LCD module, reducing reflection and boosting readability even in sunlight. The Iconia W4 features a 16:10 ratio with 1280 x 800 pixel resolutions, a 2MP 1080P front camera, and a 5 MP rear camera with autofocus that supports 720p/1080p at 60 FPS/30 FPS respectively for great photos and videos. Driven by the 4th Generation Intel® Atom™ 1.8 GHz processor, users can enjoy a smoother video playback, gaming and web-browsing experience. For true one-hand tablet usage, the built-in tablet portrait mode provides a pleasant one-page experience whether users are checking apps, browsing the web, reading or even responding to emails and social media posts. Windows 8.1 includes several new and intuitive features, such as InstantGo which makes the tablet ready to go at any moment by keeping data and apps refreshed and up-to-date even when the screen is off, by maintaining an Internet connection. The Iconia W4 comes with Microsoft Office Home and Student 2013 so users can create and edit Microsoft Word, Excel and PowerPoint docs virtually anywhere, while an optional full-sized keyboard enables more productive typing on the go. In addition, sharing content and data between the Iconia W4 and other devices is convenient through its range of ports. The HDMI® Micro port provides easy audio-video connections to an external display for sharing presentations and other content. It also has Micro USB for connecting to devices like phones, for transferring files or for power charging. Plus customers will always have room for content and data on the Iconia W4 -- it comes with either 32GB or 64GB(2) of internal storage, and supports up to an additional 32GB(2) of storage capacity via the microSD. What's more, the Iconia W4 also features a sleek design that is slim and lightweight -- it weighs only 0.91 pounds (415 grams) and measures 0.42 inches (10.75 mm) thin, so it's easy to take anywhere. 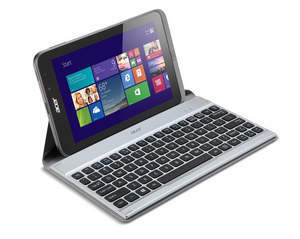 Acer Crunch Keyboard -- for users who need a keyboard, Acer offers a state-of-the-art, ultra-slim Crunch Keyboard fitted in a soft synthetic leather cover that easily folds outs while also serving as a tablet stand. The stylish 0.21 inches (5.3 mm) thin silver keyboard offers Bluetooth® 3.0 connectivity and is rechargeable via Micro USB. Acer Crunch Cover -- made with durable microfibers, the Crunch Cover folds out into a tablet stand with multiple angle settings to suit each user's reading preferences. The slim-fit cover keeps clear of all ports and is available in several fashionable colors. Other options include the Acer Keyboard Cover, protection film, responsive passive stylus, power bank, adaptor kit with bag, and Micro USB cable. The Acer Iconia W4 starts shipping this month in the United States. Manufacturer's suggested retail prices are $329.99 for the model with 32GB of storage, and $379.99 for the model with 64GB of storage. © 2013 Acer Inc. All rights reserved. Acer and the Acer logo are registered trademarks of Acer Inc. Other trademarks, registered trademarks, and/or service marks, indicated or otherwise, are the property of their respective owners. All brands and product names mentioned herein include trademarks of their respective companies and are used solely to describe or identify the products. All offers subject to change without notice or obligation and may not be available through all sales channels. Prices listed are manufacturer suggested retail prices and may vary by location. Applicable sales tax extra. (1) With 720p video playback; actual battery life varies depending on product specifications, computer settings and applications or features launched. All batteries' maximum capacity diminishes with time and use. (2) Accessible capacity varies: (MB = 1 million bytes; GB = 1 billion bytes).